Enchanting mountain trails, serene lakeside villages, and a quirky capital bring artistry and verve to this blossoming Balkan oasis. From fertile valleys and forest-clad mountains to ancient churches and chic urban centers, Macedonia is a land of delightful contrasts. 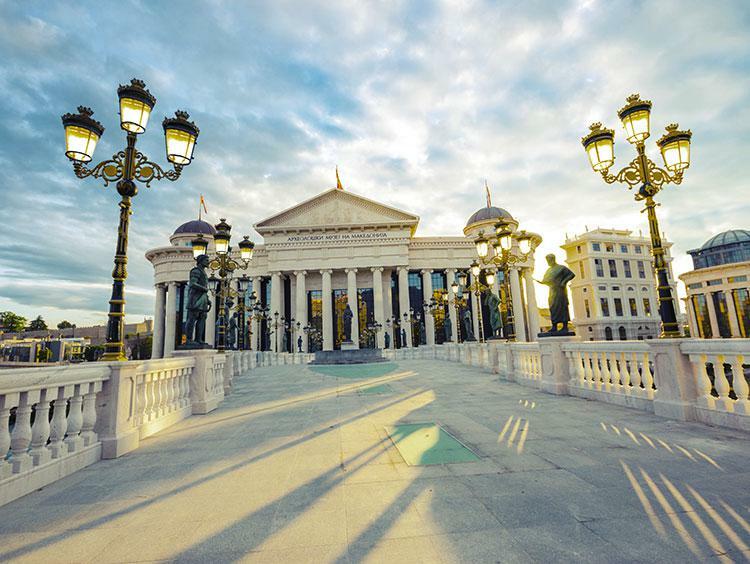 By far the largest city is the capital of Skopje, one of the leading cultural centers of the Balkans. Here, explore Macedonian artistic heritage at first-class institutions such as the Museum of Contemporary Art, the Macedonian Academy of Sciences and Arts, and the Macedonian Opera and Ballet. Other important cities include Bitola, Kumanovo, and Prilep. Ohrid serves up perhaps the country’s single greatest concentration of historical landmarks—it’s often compared with Jerusalem for its archaeological and religious significance—as well as the sublimity of its lakeshore setting. Wherever you are, enjoy Macedonian cuisine to the fullest: You’ll detect the culinary imprint of Turkey, Greece, and other neighbors in dishes such as dolmas and lamb kebabs. While the majority of Macedonia’s people are ethnic Macedonians—part of the Slavic cultural group—many Albanians also live in the country, particularly in the northwest. You’ll see the unmistakable Cyrillic script, in which the Macedonian language is written, throughout the country. Religion permeates the country, with Christianity and Islam being the leading faiths. Macedonian culture can be splendidly expressive, and in no manner more so than music and dance. Besides a strong tradition of classical music, hymnals, and age-old folksongs, the country’s yearly Skopje Jazz Festival is globally renowned, and homegrown pop has a powerful presence. Sample Macedonia’s notable artistic heritage at Skopje’s Museum of Contemporary Art. The delicious dishes in Macedonia reflect both the balmy, hospitable climate of its lowlands—excellent growing conditions—and strong culinary influences from the rest of the Balkans, the Mediterranean, and Turkey. A flagship meal is tavce gravce, a beanand-onion stew that comes in countless regional variations. Many a meal comes accompanied by the puffed-up flatbread called pita. Baklava, kebabs, and dolmas—eaten widely throughout the region—have their own Macedonian versions. Popular beverages include Turkish coffee, kefir, wine, and the regional liquar rakia. In this food-loving culture, it’s wonderful to sample local cuisine across the full spectrum, from a street vendor to a fancy sit-down restaurant, where you’ll often be able to taste firsthand how inspirations from farther afield (such as Western Europe) manifest on a Macedonian plate. 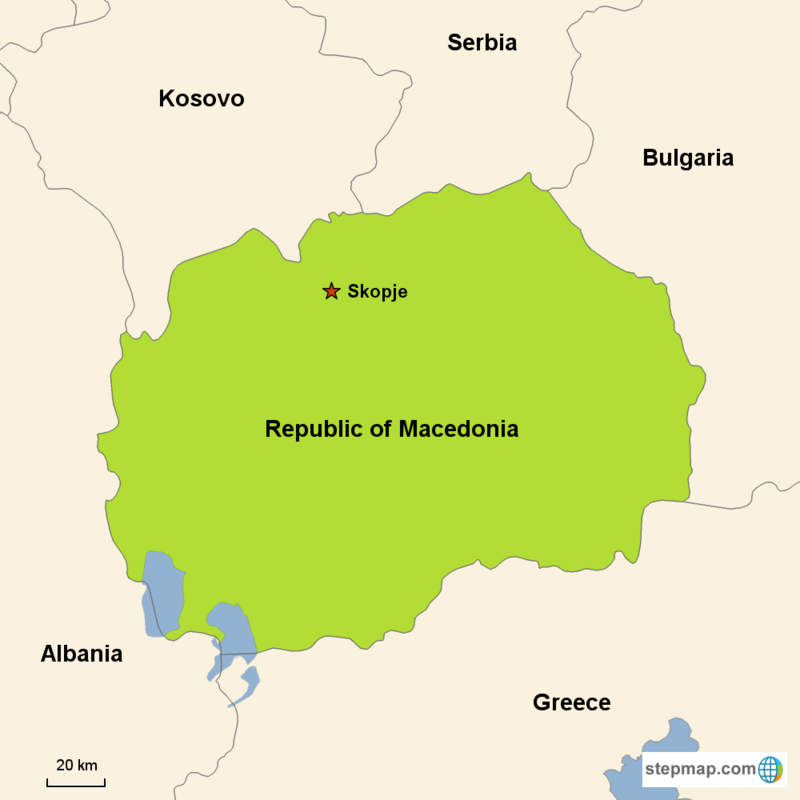 The Republic of Macedonia describes part of the northern reach of the historical region of Macedonia, which encompasses a large section of northern Greece and a corner of Bulgaria. Macedonia proper is quite mountainous, with the highest peaks lying in the great Sar Mountains of the northwest—one of the defining chains of the Balkans. The country reaches a stunning high point in Mount Korab, just over 9,000 feet tall. The most important drainage is the Vardar River, which flows through a broad central valley into the Aegean Sea. The capital of Skopje lies in northern Macedonia on the Vardar. The mixed hardwood and conifer forests of the Macedonian highlands remain an important refuge for some of the country’s most charismatic animals, including the brown bear, gray wolf, Eurasian lynx, and wild boar. Macedonia had a complicated and restless history ahead of the Roman era: The most notable of the endlessly ebbing and flowing powers was the Kingdom of Macedon. This relatively short-lived empire certainly packed a historical punch: Alexander the Great was the son of Phillip II of Macedon. Macedonia’s Albanian population likely derives from another ancient tribe in the region, the Illyrians. Relics from the long-standing Ottoman Empire abound in Macedonia, as in the monuments of Ohrid (a UNESCO World Heritage Site). Another unsettled period of Macedonian history followed the end of Ottoman power in the early 20th century, with independence ultimately achieved from Yugoslavia in 1991.